“The symptoms of GERD include heartburn and regurgitation of stomach contents,” explains gastroenterologist Kevin Ghassemi, MD, Center for Esophageal Disorders, Division of Digestive Diseases, David Geffen School of Medicine at UCLA. 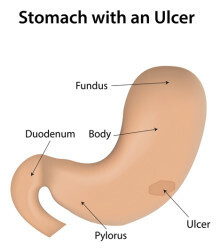 What’s Behind Your Stomach Ulcer Symptoms? If you’re experiencing a stomachache or what could be stomach ulcer symptoms, you should know that there are many types of ulcers and many places within the digestive system in which they can occur.